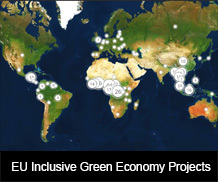 Many opportunities exist to integrate inclusive green economy considerations in various sectors of EU cooperation. This is particularly the case in programmes prioritising areas such as economic growth, private sector development, agriculture, water and energy. With growing interest globally in the green economy concept, specific tools and studies have been developed that can support the mainstreaming of inclusive green economy aspects into cooperation programmes in relevant sectors. Among others, UNEP has developed tools and produced studies, with EU support, such as national level green economy assessments and scoping studies. UNEP, including the offices in Paris, Nairobi, Thailand and Latin America, is a key target group in terms of coordinating the SWITCH to Green flagship initiative actions with the 10YFP. Besides, UNEP is involved as an implementing partner of the SWITCH components (e.g. SWITCH Asia policy support, SwitchMed Network Facility, etc.) and is considered a strategic partner for identification of future programmes (in terms of global replication). Cooperation with public institutions to create enabling frameworks is crucial. PAGE, supported by the EU through the Global Public Goods and Challenges (GPGC) programme, is an example of a programme that aims to “reframe economic policy around sustainability and put in place enabling policy conditions, reforms, incentives, business models and partnerships”. SWITCH Regional Programmes (Asia, Africa, Med) and their grantees (with an eye on possible development towards Latin America and the Caribbean region).